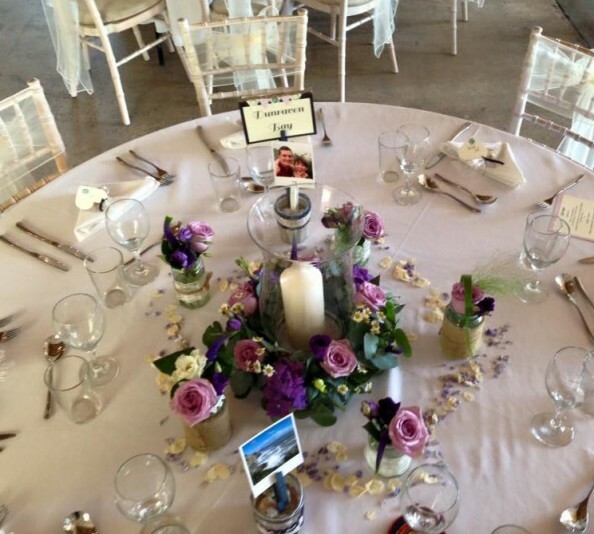 Sometimes deciding how to arrange and set your tables for your big day can be daunting and confusing. It is important to think of what food will be served such as if you are having sharing platters, large bulky centerpieces are not ideal and will leave your guests feeling cramped. Bella Rose have a large collection of centerpieces and table decorations. All of our centerpieces can be mixed and matched – if requested – to suit your style. 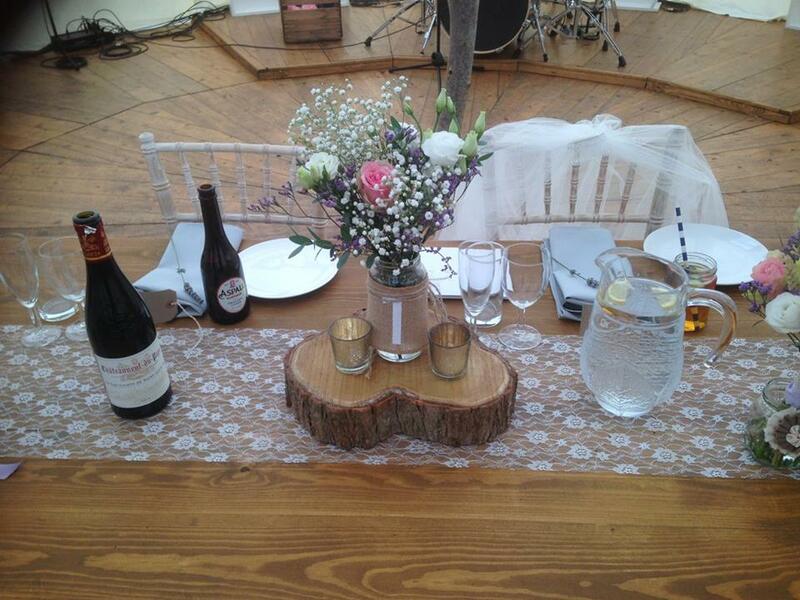 Our log slices have all been sanded and varnished so they are spill proof but keep their rustic charm. They can be used with jam jars, bottles, candles, flowers, birdcages…the list is endless. Stacking two slices to create height and a ledge can be a great feature. 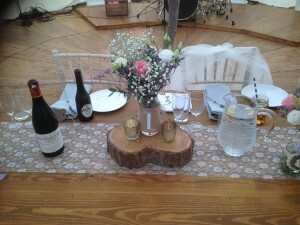 Log slices can be used all around your ceremony or venue not just as centerpieces. They are great flower steps, doorstops, and sweets or drinks display platforms. Due to the nature of this product slices vary but can be matched together in sizes. Mirror plates add a touch of glamour to a centerpiece and look absolutely gorgeous with candles lit on them as well as flower petals scattered. Our circular mirror plates work wonderfully with our fishbowls, jam jars and birdcages. You can do so many things with fishbowls. We hire fishbowls out on a DIY basis, as the amount you can do with them is never ending. Some great things we have seen done include wrapped green leaves, sunflowers, gel beads, lilies, petals and floating candles. We have even served alcohol and non-alcohol cocktails in them that were a great talking point for guests and a fabulous idea for a wedding. Our 50cm tall martini glasses are perfect for a glamorous centerpiece idea. They can be filled with fresh flowers, floating candles, glass or gel beads to bring your theme to life. Our gorgeous white birdcages can be decorated or simply left as they are. They work perfectly on tables if you are looking for something without too much height. They stack wonderfully onto log slices and scattered with candles or petals. They can be stuffed with fresh flowers or a simple imitation flicker light for that intimate glow. These birdcages are so versatile and can be used around ceremony or venue; ours have been used on the register table, cake table, outside steps and to decorate dressers and quirky alcoves. Our ever popular table runner, looks so beautiful with delicate lace edging, great for wedding breakfast tables but also a great idea for the following tables; cake, evening food, signing the wedding register, cards and guest books as well as adding a gorgeous touch to a dresser. A beautiful blush colour that compliments any colour scheme and adds so much glitz to a table. They look stunning under soft fairly lights and photograph beautifully. We also carry a matching cake table sequin cloth. See our full price list here, or get in touch with us on our Contact page.